Properly adjusted stirrups allow you to sit straight up in your saddle and back on your pockets, with your heels down, balance in the balls of your feet and legs slightly in front of you. Professional barrel racer and clinician Kendra Dickson has a saying—you have to keep your feet to keep your seat. 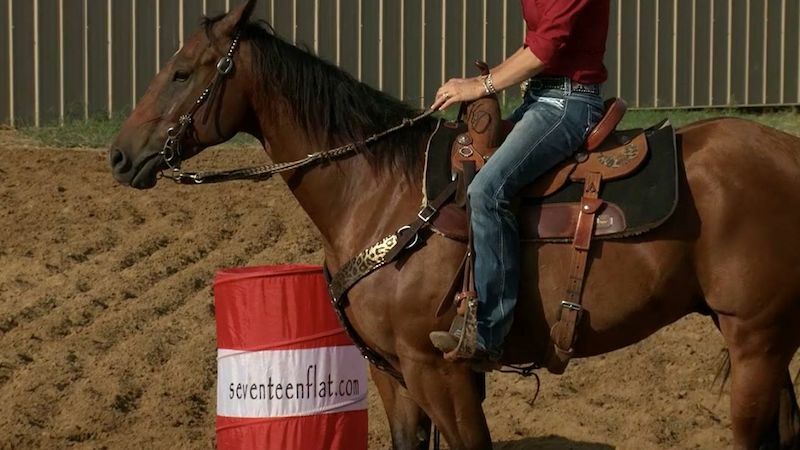 Many barrel racers ride with their stirrups too long, causing problems during a run such as leaning and rocking, balancing on your hands, getting unseated in a turn, toes down and legs back, and not using your legs and seat correctly. If you’ve ever felt thrown off balance during a run or feel like you don’t have control of your upper body, you might want to take Kendra’s advice and bring your stirrups up a few holes. Here’s why. Watch the video here Keep Your Feet to Keep Your Seat. 1. Shorter stirrups give you more control of your upper body. Being able to balance on your stirrups will help you to sit in the middle of your horse throughout the turn and keep your body still instead of leaning or rocking. Press down into your stirrups through the ball of your feet. This helps you stay more secure in the saddle and keep a deeper, more relaxed seat. 2. Stirrups that are too long force you to grip with your knees or balance on your hands, creating an anxious horse. Long stirrups cause you to clamp the thigh muscles and grip with your knees to hold your balance since your weight isn’t in your feet, sending mixed signals to your horse and creating a stressed and nervous animal. Kendra Dickson compares it to someone clamping down on your shoulders as you are trying to take a test. It will only make you more distracted and stressed during the test, just as a rider constantly gripping with their knees during a barrel run distracts the horse. Not having balance in your feet also causes you to overcompensate by balancing on your reins, and constantly pulling on your horse’s mouth to keep your body steady is never a good thing. Kendra Dickson demonstrates incorrect body position. 3. Long stirrups throw your weight forward and cause your feet to get behind you, because you don’t have anything on which to balance. Not only is this incorrect horsemanship and body position, but it makes it very difficult to ride effectively as it shifts your body weight over the saddle horn and prevents you from using your legs and seat to cue your horse. It’s also dangerous to be so out of balance when running barrels at a high rate of speed with sharp turns. 4. Keeping your heels down is easier with shorter stirrups. If you’re constantly reaching for your stirrups with your toes, you can’t keep your heels down and therefor can’t get your body into an effective position. Long stirrups throw your upper body forward, legs back and toes down. Bringing your stirrups up a few holes will give you greater balance through your heels and bring your body into a more upright position in the saddle. Shortening your stirrups will help sit you on your seat bones in the saddle with greater control of your upper body, in position to correctly cue your horse with your legs, seat, and hands throughout the run. We’re running for thousandths of a second, so it’s important to set yourself up for success from the start with correct body position. Watch Kendra Dickson explain ‘Keeping Your Feet to Keep Your Seat’ in this video and find many more at TrainingBarrelHorses.com.